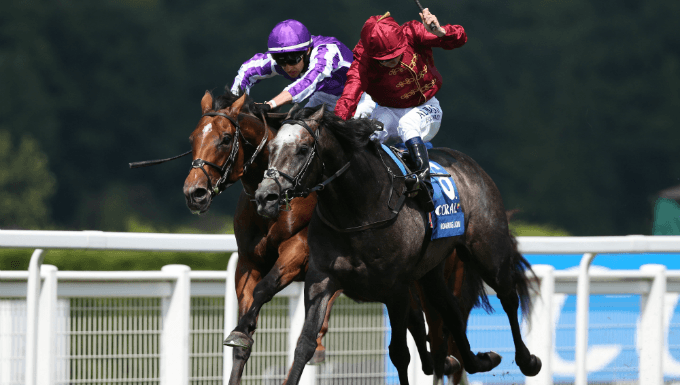 Roaring Lion is the odds-on Irish Champion Stakes betting favourite, having established himself as the horse to beat over 1m 2f this term, following his cosy victory in the Juddmonte International at York. John Gosden’s three-year-old grey heads into the Irish Champions Weekend as one of the hotpots of the meeting, but is he such a sure thing as to warrant his current odds of 4/5 with most horse racing betting sites? What is the Irish Champion Stakes? The Irish Champion Stakes at Leopardstown is one of two Group 1 races on the opening day of Longines Irish Champions Weekend, the other being the Matron Stakes for fillet and mares. Worth a cool €1,250,000, it often proves a great pointer to other feature events on the flat horse racing calendar, notably the Arc meeting in France and British Champions Day. As part of the Win and You’re In Challenge Series, it even throws up some Breeders Cup form! His Juddmonte triumph was Roaring Lion’s third win of 2018, which undoubtedly gives him the edge over, but is asking him to complete a hat-trick of Group wins, and a fourth victory this year, a step too far for the colt? Pitching for Team GB, Roaring Lion is currently Europe’s highest rated three-year-old after his York victory, and his owner, Sheikh Fahad of Qatar Racing, is the sponsor of the race – some would say that perhaps that’s a tip in itself. Many of his supporters will be buoyed by the fact that his jockey Oisin Murphy can do everything but walk on water at the moment, as the 23-year-old Killarney-born Murphy, bids to collect Group race number seven this season - and his first one ever in Ireland. Lining up against Roaring Lion for an astonishing sixth time this season is the Aidan O’Brien-trained Saxon Warrior, Ireland’s leading contender. Many punters believe that Saturday’s teatime feature will be the best chance the Deep Impact colt has had of levelling up the series 3-3 with his great adversary Roaring Lion. Things did not quite pan out for Saxon Warrior over 1m4f, but the 2,000 Guineas winner was within a neck of Roaring Lion in the Coral-Eclipse, just seven days after running in the Irish Derby. After finishing fourth, beaten five lengths by Roaring Lion at York last month, O’Brien revealed that Saxon Warrior got very sick after Sandown, and that his Juddmonte performance was as good as he could have been expected. Given the fact that the O’Brien stable appears to be on the recovered side of a yard bug, and that 24 days have elapsed since York, then it is highly probable that Saxon Warrior will arrive at Leopardstown at the top of his A-game. French entry Study Of Man will add some “joie de vivre” to proceedings on Saturday afternoon, after connections decided to reroute him from running on home soil in the Prix Niel. Owned and bred by the Niarchos family, the three-year-old appears to be using the Irish Champion Stakes as a stepping stone to the Prix de l'Arc de Triomphe in three weeks time. The Pascal Bary-trained colt looked all set for a glorious season when winning the Prix du Jockey Club at Chantilly, but was disappointing when a well-beaten third to Knight To Behold at Deauville last month. That race was a strangely-run affair though, and connections believe that Study Of Man will be seen to better effect at Leopardstown. Odds of 7/1 with BetVictor look to be a steal for each-way punters, on a horse that will most certainly need to achieve a podium finish in Ireland to hold any kind of a serious chance at Longchamp on October 7. In addition, the top price of 25/1 on offer with Paddy Power for Study Of Man to win the Arc is sure to get snaffled up quickly should he put up a bold show on Saturday.